Born January 6, 1924 in Albany, Ga., Harry grew up in Altoona, where he graduated high school in 1942. He then came to Middletown to work at Olmsted Air Force Base as a machinist. He enlisted in the Navy in 1943 and served aboard the Battleship West Virginia during World War II. He was honorably discharged from the Navy in 1946 and married Catherine L. DeWitt on August 26, 1946. 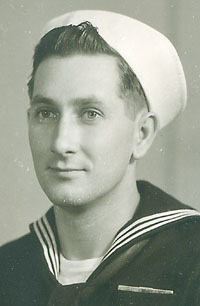 Harry was recalled to service by the Navy in 1950 to serve aboard the Heavy Cruiser Saint Paul during the Korean War. Honorably discharged in 1952 in San Francisco, Calif., he then began a cross-country trip with his wife and young son Harry II back to Middletown. He began work at Met-Ed Crawford Station as a machinist. Upon start up at Three Mile Island he began working in the Health Physics Lab, and retired in 1986 as a machinist after 34 years. His interests included 20th century music, Native American culture and World War II history. Harry’s true passion was anything and everything antique cars, especially Packards. Their motto read, “Ask the man who owns one” and that was Harry. Even though a Packard man, his most prized automobile was his 1929 Graham Paige 827 Victoria Coupe. He was a member of the Antique Automobile Club of America, Hershey Region Car Club, Packard Club, and Hudson Essex Terraplane Club. He was preceded in death by his father Russell C. and mother Helen E. Weest Furst, daughter Deborah L. Furst, brother Russell Furst and Harry’s wife Catherine L. DeWitt Furst. He is survived by two sons Harry W. Furst II (Sandra) of Walnut Creek, Calif., and Thomas A. Furst (Susanne) of Middletown. Relatives and friends are respectfully invited to attend Harry’s Life Celebration Memorial Service at 11 a.m on Thursday, May 30 at Coble-Reber Funeral Home, 208 N. Union St., Middletown, with the Rev. Dr. J. Richard Eckert officiating. Interment with military honors will be in Middletown Cemetery. Visitation will be held from 10 a.m. until time of service on Thursday at the funeral home. Memorial contributions may be made to American Red Cross Disaster Relief Fund, P.O. Box 4002018, Des Moines, IA 50340-2018. Please write Oklahoma Disaster on memo line of your check. To share your fondest memories of Harry, please visit www.lifecelebration.com.